Spring Thaw Concert a Big Hit! SILT Executive Director Suzan Erem addresses the audience between performances. 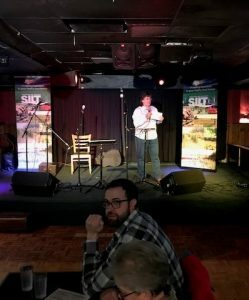 Nearly 100 people attended SILT’s first Spring Thaw Concert at The Mill in Iowa City March 30 to hear Dave Moore, Steve and Michaela McLain and a surprise appearance by Randy Davis. The concert filled the house as guests enjoyed free ReUnion Brewery beer and Wild Culture Kombucha while supplies lasted thanks to sponsorships by those to companies. Musician Greg Brown, who was playing at the Englert later that evening, came by for the first part of the show. SILT also debuted its first Raygun T-Shirts which sold quickly. The T-shirts sport the identifiable Raygun look and the statement: SILT is my favorite dirty word. T-shirts are for sale here. MidwestOne Bank was the premier sponsor of the event. Additional sponsors included Little Village Magazine, which provided advertising and Sundog and Local Harvest CSA which donated a summer of fresh veggies as the main door prize. The Sustainable Iowa Land Trust is dedicated to protecting land to grow healthy food. Please donate today. Time’s running out for our next generation of aspiring farmers.